Now delivered in a measured 4oz. pump that dispenses the exact amount you require -- eliminating any chance of contamination from exposure to the air or finger. Advanced Retinol-A Wrinkle Cream is the only non-prescription face cream proven to diminish fine lines and wrinkles. Applied regularly to the skin it will create a smoother and rosier glow. The strongest cream available. Most users, men and women, see immediate results. Our price is $50-$100 less than some department stores and our product works better. 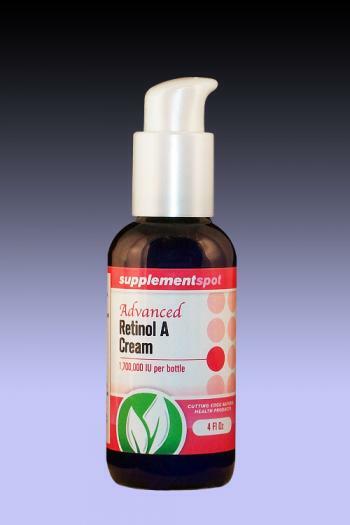 Advanced Retinol A Cream works underneath the surface of the skin to help repair deep wrinkles and damage that traditional moisturizers and creams fail to improve. After a few weeks of proper use, skin gradually feels firmer and softer. Complexion will improve, and wrinkles, fine lines, and age spots will be reduced. Dead cells will be sloughed off as new cells begin to grow underneath and push their way towards the surface of the skin. Pigmentation will begin to look more even. Now paraben-free and with a whopping 1,700,000 IU in each bottle!